Celebrated German opera singer Willi Domgraf Fassbaender (1897–1978) was one of the leading lyric baritones of the inter-war period. He was particularly associated with Mozart and Italian roles. 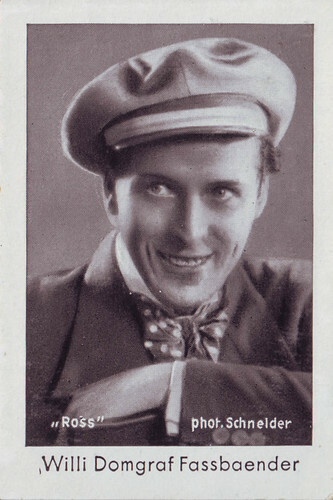 During the 1930s, ‘the Italian baritone’ starred in a number of musical films, which helped his shining international reputation. German postcard by Ross Verlag, no. 7290/1, 1932-1933 (sent by mail in the Netherlands in 1935). Photo: Atelier Schneider, Berlin. Willi Domgraf Fassbaender (also written as Willy Domgraf(-)Fassb(a)ender) was born in Aachen, Germany, in 1897. Initially, he intended to become a conductor and musicologist for church music, but eventually he studied singing with Julius Stückgold. He had a beautiful voice and used it with fine musicianship. He began his career as an oratorio and concert singer, but the director of the Stadttheater Aachen encouraged him to appear in opera and operetta. In 1922 he made his debut in Aachen as Count Almaviva in Le Nozze di Figaro. In the following year, Leo Blech engaged him to the Deutsche Oper Berlin where the young singer continued his vocal studies with Paul Bruns. Due to strong competition, Domgraf-Fassbaender changed to the opera house in Düsseldorf, completing his studies with the famous Giuseppe Borgatti in Milan. It was in Düsseldorf where he gained experience in an extensive repertoire: Figaro, Count Almaviva, Rigoletto, Wolfram, Papageno, Don Giovanni, et cetera. In 1927 he joined the company of the State Opera in Stuttgart, where he became one of its most popular singers. It was Richard Tauber (his partner in La Bohème and Carmen) who recommended him to go back to Berlin. General manager Heinz Tietjen, who was to become his mentor, contracted him to the Berlin State Opera, where he gained quickly a reputation as ‘the Italian baritone’. German postcard by Ross Verlag, no. 152/1. Photo: Aafa Film. 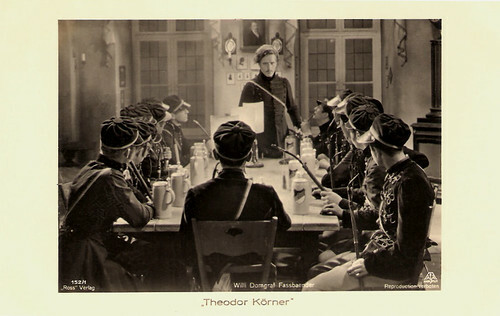 Publicity still for Theodor Körner (Carl Boese, 1932). Willi Domgraf Fassbaender was an accomplished singer-actor, and his shining international reputation was helped by his starring in a number of musical films. 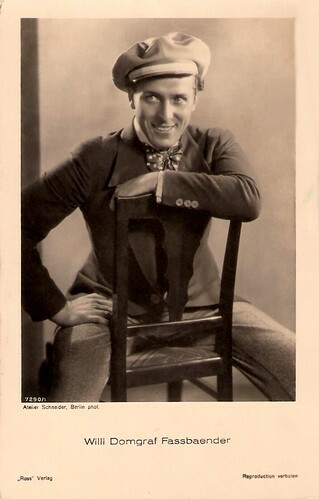 In 1932, at the heydays of the German film musical, he made his film debut in Der Sieger/The Winner (Hans Hinrich, Paul Martin, 1932) with Hans Albers. An adaptation of Friedrich Smetana’s opera Die Verkaufte Braut/The Bartered Bride (Max Ophüls, 1932) with the beautiful Jarmila Novotnà in the title role, gained world-wide success. He sang the role of Hans, which was originally meant for a tenor. That same year he also appeared in the short film Goethe-Gedenkfilm - 1. Der Werdegang/Goethe Memorial Film, part 1 (Fritz Wendhausen, 1932), and in Theodor Körner (Carl Boese, 1932) with Dorothea Wieck. Next he starred in Ich will Dich Liebe lehren/I Will Teach You to Love (Heinz Hilpert, 1933). He insisted on also playing in the alternate French version, L’homme qui ne sait pas dire non/The Man Who Doesn't Know to Say No, but his accent was so bad that this version was never released. After the rise to power of the Nazis, he became a party member of the NSDAP in May 1933. The following years he was the star of Aufforderung zum Tanz/Invitation to the Dance (Rudolf van der Noss, 1933), Starke Herzen/Strong Hearts (Herbert Maisch, 1937), Ein Lied von Liebe/A Song of Love (Jürgen von Alten, 1938) in which he starred with his wife Sabine Peters, and Lauter Liebe/Pure Love (Heinz Rühmann, 1940) with Hertha Feiler. German postcard by Ross Verlag, no. 152/4. Photo: Aafa Film. 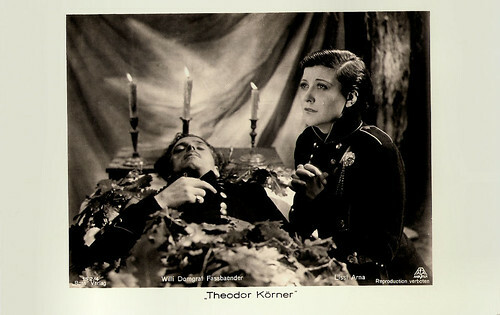 Publicity still for Theodor Körner (Carl Boese, 1932) with Lizzy Arna. Willi Domgraf-Fassbaender’s devotion to modern works was quite remarkable (including operas by Malipiero, Wellesz, Schoeck), but his career was dominated by his Italian parts and Mozart. Fritz Busch invited him to the Glyndebourne Festival, where he sang the Count in Le Nozze di Figaro as well as Guglielmo in Così fan tutte in the 1934, 1935 and 1939 series. In 1937 he was chosen by Arturo Toscanini to sing Papageno in Die Zauberflöte/The Magic Flute at the Salzburg Festival. In 1942 he received the title of ‘Kammersänger'. After World War II, he performed mostly in Vienna, Munich, Hannover, and Nuremberg. At the Vienna State Opera, he sang Wolfram, Papageno and Ford. His last film appearance was as Figaro in the DEFA production of Figaros Hochzeit/The Marriage of Figaro (Georg Wildhagen, 1949) with Angelika Hauff and Sabine Peters. After 1951 Domgraf-Fassbaender worked as an outstanding stage director. In 1954 he went to the Conservatory of Nuremberg, where he led the opera school and taught a vocal class. Willi Domgraf-Fassbaender died in 1978, in Nuremberg. His only daughter, from his marriage with Sabine Peters, was mezzo-soprano Brigitte Fassbaender (1939), who studied exclusively with her father and was to become a celebrated mezzo. German collectors card by Ross, Haus Neueburg Film Album 2, no. 167. Photo: Schneider. Collection: Manuel Palomino Arjona (Flickr). 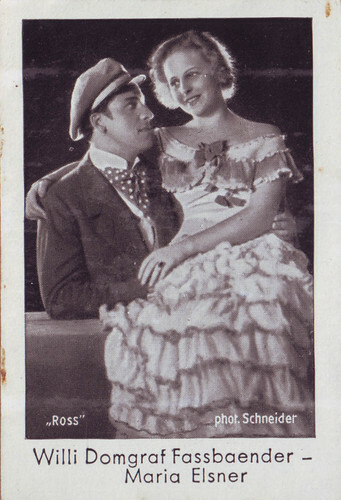 With Maria Elsner in a stage production. German collectors card by Ross, Haus Neueburg Film Album 2, no. 211. Photo: Schneider. Collection: Manuel Palomino Arjona (Flickr). Sources: Andrea Suhm-Binder (subito – cantabile), Thomas Staedeli (Cyranos), Wikipedia (German and English), Filmportal.de, and IMDb.